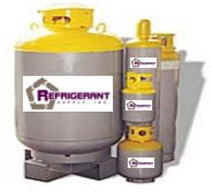 are a sub-web courtesy of Refrigerant Supply Inc. THE DATA PRESENTED ON THIS DATASHEET HAS BEEN COLLATED FROM A NUMBER OF SOURCES. THE DATA HAS NOT BEEN VALIDATED. USE THIS DATA AT YOUR OWN DISCRETION - REFRIGERANT SUPPLY INC. DOES NOT GUARANTEE ITS ACCURACY, OR ITS APPLICABILITY TO ANY PURPOSE.